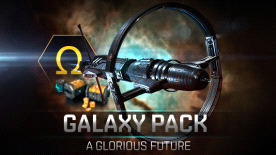 The Galaxy Pack represents excellent value and commitment to your future as an EVE Online capsuleer of great repute. This bundle gives you unlimited access to all ships and skills through 3 months of Omega time. You will also get 2x Multiple Character Training Certificates, allowing you to train multiple pilots on the same account simultaneously, as well as 1100 PLEX to sell for billions in ISK or spend in the New Eden Store. In addition, you get 5 Skill Extractors to aid you in customizing your skill tree and making even more ISK, as well as a bundle of superb Sisters of EVE ship SKINs and Expeditionary Suits.